A proven Medical marvel for those in need of high levels of the most active cannabinoids such as CBD. Almost toxic at times, so handle with care and don't abuse the medicine, man . It has won many awards since its introduction as the white rhino in the late 90's. An incredible strong genetic heritage stemming from a Brazilian sativa/South Indian hybrid combined to a prodigious-yielding Afghani. It is in the Widow family and a proven champion for the sick and terminally -ill patients. 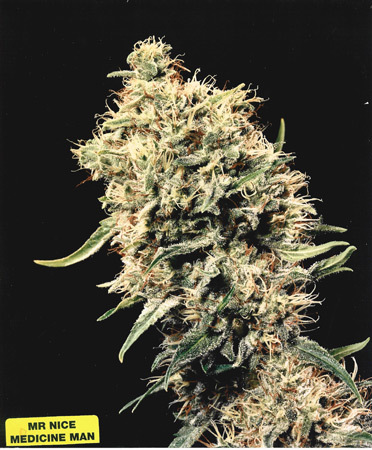 For those who prefer indoors, then expect an incredibly resinous and compact Indica look from this plant. It has an expected flowering time of 56 to 60 days. For outdoors in the northern hemisphere expect harvest around October and in the southern hemisphere by May. The yield should be at least 600 grams a square meter... but be careful how you handle the Medicine, Man! Flowering period: Indoor expect it to be completed in 56 to 65 flowering days.In the northern hemisphere it should be completed by October and in the southern hemisphere by late April to May. Special Notes: It was also known as White Rhino when it was first released - a tribute to Denis Peron's (art.215) for Medical growers. Med man and Critical Mass....first grow in three years. Click here to visit "Medicine man" forum!